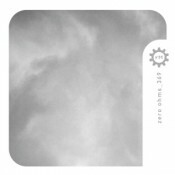 Long loops of droning flute and electronic wind instrument blend with field recordings in a dreamy wash on Zero Ohm’s meditative 369. Zero Ohms (aka Richard Roberts) guides the listener through a spiritual voyage that begins with us grounded in the real world and ends with us in some blissful, relaxed elsewhere. Roberts accomplishes this in three mid-length tracks that never raise their voice above a loving whisper. The tracks are each titled with one number from the album title. “3” begins the journey and it’s here that the field recordings play their part. Nature sounds, gruff (and, it must be said, slightly jarring) voices calling out in some unidentifiable language, and the crisp crunch of leaves underfoot suggest that we are out walking somewhere. Point being, we are aware, at this point, of the world around us. The world we will soon drift away from. Throughout this voyage, Roberts’ tones are consistently warm, enveloping, and organic. To call them drones does them a slight disservice; it is more of a slow current, shifting gracefully but not imperceptibly, and in constant motion. It is in very short order that we give ourselves over to the sound. On “6,” the field recordings fade back, and Roberts surrounds the listener with low, shadowy sounds that still maintain warmth. He stretches them out to a rise-and-fall that brings our breathing in line, and this is where we leave the concrete world behind. The slow weave of sounds is mesmerizing. This track alone is reason enough to hear this release. “9,” the closer and the shortest track at just over 10 minutes, brightens considerably from its predecessor right from the start. It’s as though we’ve passed through a space between the concrete and the spiritual, and here we are, in some indefinable place beyond. This track contains a signature Zero Ohms sound, a texture that for lack of a better term sounds like a brief throatiness, a grounding solidity amidst the softer, ethereal sighs. 369 is a superb piece of work from Zero Ohms. While I do have my minor issues with the disruptive aspect of the voices in the field recordings, the effect very fades as the music deepens and leaves the solid world behind. It’s an artistic choice and, in the long run and looking at the effect of the release overall, it works. This release will take you very deep, and it loops nicely for maximum immersion.